I've been making these nachos for the Super Bowl for the last 15 years. Up until last year, I would ONLY make them for Super Bowl. While neither of my boys were football fans, they always looked forward to the Super Bowl just for these nachos! They are equally good with shredded chicken, but shrimp makes them truly special for me. They only require a handful of ingredients, but I promise you . . . this will be your new, go-to, nacho cheese recipe! They require only a few ingredients - a jar of Cheez Whiz, sour cream and salsa, along with your meat choice. Of course you can add your favorite toppings. 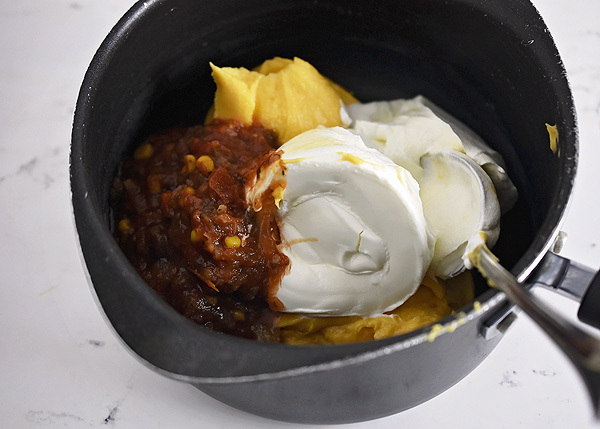 Combine the sour cream, jarred cheese, and salsa in a medium saucepan. Mix over low heat until blended and bubbly. Remove from heat and while hot, pour over nachos. I prefer to top with chopped, fresh tomato, onion and black olives. Eat and repeat!